I remember when I first got into Sandman. Freshman year of high school in the mid-90s, too young to truly get it but old enough to start reading such grownup material by the great Neil Gaiman. I came across some defunct Wizard magazine issue, at the height of my superhero obsession, it was about villains and cosmic beings and mentioned the mysterious Endless. Then I got the proto-Vertigo issue of “Who’s Who” that focused on the mature reader’s Vertigo comics, teaching me the basics of that mythology. I was intrigued. A reputation was forming. But instead of getting the latest Sandmans on Wednesday at the comic shop, it seemed this one was no mere monthly periodical. Seemed it needed to be read like proper books. I did get the first graphic novel collection, Preludes and Nocturnes, which made for a slow start. Then I ultimately ordered the rest from a book publisher outlet, out of order. Reading about the fall and rise of Lucifer and the key to hell, stories at the World’s End Inn, and I tried to make sense of it storyline by storyline. It taught me much about Greek mythology, Shakespeare, and Edwardian occult groups. One chapter won the World Fantasy short story award, I believe the only comic to do so. Seventy-five odd issues with various special editions. Eventually, I caught up to it all, and had to reread and reflect several times over in my life. Vertigo’s greatest success. A uniquely popular DC comics for women as well (my sister read too). And goth kids. Like many of the world’s greatest comics, the name was a jumping off point based off corny comics from the 40s and/or 60s. There was Golden Age Sandman, some detective with a sleep gun. There was the Kirby Sandman, a superhero battling in the land of dreams. All those characters were incorporated into Gaiman’s epic, though not the core. Sandman was originally even in the DC Universe proper, with early issues including a few superheroes. That soon grew too small a setting and Gaiman wasn’t limited by continuity, though he toyed with DC history on occasion. The main protagonist, if you will, was Dream of the Endless. Also known as Morpheus, ruler of the land of dreams. Dream was not a god because gods need to be worshiped to exist. He was a member of the Endless, which have higher origins. There was Destiny the oldest — who was a host from 70s horror comics, sister Dream, Destruction, Desire, Despair, and Delirium. Sense a pattern? But you can’t write a monthly comic based off near-omnipotent beings. Oftentimes, this mythology was the starting point for short stories about other mortals interacting in this grand fantasy world. And the immortals, the demons, the witches, and the lovers. The historical figures. It’s tricky to claim one protagonist. Let me speak a moment about Death. One of the most interesting creations was Gaiman’s interpretation of Death. Not a dark reaper, but a cutesy goth girl who gives great advice. You end up just adoring her. She even got two of her own miniseries, lovingly illustrated by Chris Bachelo: The Time of Your Life. Very much worth reading. I won’t give anything away, but the story of Morpheus concluded with a solid ending by number 75. Neil Gaiman has come back from time to time, such as with original graphic novels/novellas Dream Hunters and Endless Nights. But most spinoffs of the rich Sandman mythos have been written by others. In my personal opinion, Gaiman peaked as a comic writer. His prose does not compare. He’s a charming wordsmith, and he’s became very famous, but I always feel a bit let down that so many people read his novels yet never the comic. I don’t know, I just didn’t get that much out of American Gods and Neverwhere. Sandman, however, has warmed my heart and fascinated me throughout my times. I did enjoy Good Omens very much, cowritten by Terry Pratchet (RIP). Stardust meanwhile is a must-read fairy tale, but I must express my disappointment with the greater readership once again. The original illustrated version with art by Charles Vess is essential, don’t get the paperback. 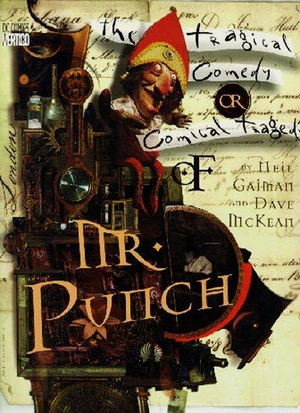 Another original graphic novel worth it was The Tragical Comedy or Comical Tragedy of Mr. Punch, with the brilliant collage artist Dave McKean (who did the Sandman covers). A simple tale of youth and the horror of childhood. Now that one freaked me out. I’ve read several others. Went back and found his rare, interrupted Miracleman run. 1602 for Marvel was sub-par. Black Orchid as well. Batman: Whatever Happened to the Caped Crusader? was decent I suppose. These days Gaiman is obviously not so prolific in comics; he has since become primarily a novelist. I say that the world is missing out. There is one more to read though. 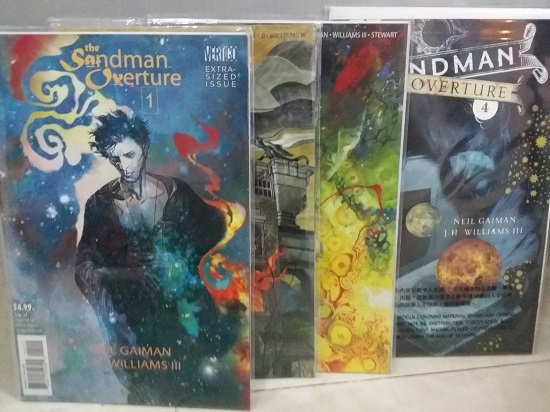 Currently, in the midst of the latest Sandman update, entitled Overture. It’s a high-concept prequel, focusing on Dream’s travels across the universe, and it brings back that pure 90s Vertigo fantasy that I loved so dearly. That’s forever Neil Gaiman, to me. And on to further writers. To be continued with a certain master who was mentor to Gaiman himself. A mad genius who disavowed DC and all mainstream comics, even though Vertigo and Sandman wouldn’t have existed without his contributions. It isn’t controversial to say he is the single greatest comic writer of all. He is also possibly the most brilliant living author period. This entry was posted in Comics and tagged American Gods, Charles Vess, comics, Dave McKean, DC, Death, Good Omens, Mr. Punch, Neil Gaiman, Neverwhere, Sandman, Stardust, Terry Pratchet, Vertigo by Ray. Bookmark the permalink. Oh I did read Death’s spinoffs. And Mr. Punch (my ex boyfriend was a big fan of Dave McKean). Did you watch Mirrormask? I do enjoy Gaiman’s novels. Good Omens is so funny, hahaha. American Gods was also ok, and Neverwhere. And Coraline is so dark! I also liked the movie. What do you think of the new series? It should be a prequel, right? Its good, just very high-concept and cosmic. I wouldn’t recommend for new readers. J.H. Williams’s art is, as always, phenomenal. Sandman is one of my fave comics. I love NG.